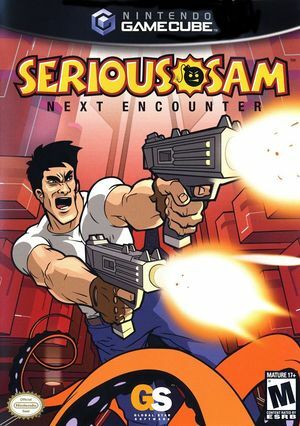 Serious Sam: Next Encounter is a spin-off first person shooter in the Serious Sam series of video games. The game is a first-person shooter featuring both single and multiplayer modes. The single-player story mode sends the player through various historical settings to face off against legions of monsters. The two multiplayer modes consist of a deathmatch mode and a co-op version of the story mode. Serious Sam: Next Encounter has a native 16:9 display option, but it requires enabling it in its internal options and setting Dolphin's Aspect Ratio graphics setting to "Auto". Using the widescreen hack with this title is not recommended. Player 2's screen is black if EFB is not set to RAM, and even if it is set to RAM, the resolution of Player 2's view is significantly less than Player 1's. This needs further testing, to determine if Player 3 or 4 are also affected. The emulator will get stuck into the save screen right before level loading. To fix the this, disable the memory card in slot A, or try other revision. Appears to be fixed as of 5.0-6197, possibly even earlier. The graph below charts the compatibility with Serious Sam: Next Encounter since Dolphin's 2.0 release, listing revisions only where a compatibility change occurred. 3.0-226 Kubuntu 11.10 AMD Phenom II X4 955 BE NVIDIA GeForce GT 440 Perfect, full speed. 3.5-33 Windows 7 x64 Athlon II x2 250 NVIDIA GeForce GTX 660 Good, fullspeed on most levels. D3D9, Native x3, Skip Alpha Pass. Serious Sam: Next Encounter Gameplay using Dolphin Emulator! This page was last edited on 11 October 2018, at 03:09.